Workers at the Music City Center warehouse prepare a shipment of food donations. Every year, the equivalent of about 10 million meals in Nashville are tossed in the trash, while one in six residents doesn't have enough food. That’s according to national research from the Natural Resources Defense Council, which has chosen Nashville as a pilot city for testing food waste reduction practices on a national scale. Nashville is home to several efforts around reducing food waste, but even the most determined businesses are still finding it difficult to get their donations to people who need them. Now, several companies say they can use their meal delivery drivers to help restaurants hitch a ride for their leftovers. That's the case for Miel. At this small West Nashville restaurant, a tiny freezer is packed with mason jars of preserved vegetables, pounds of meat, and the leftovers. Seema Prasad, the owner of Miel, spends a lot of time in here, figuring out what to do with unused but edible meals. Sometimes she'll use it to feed her servers. 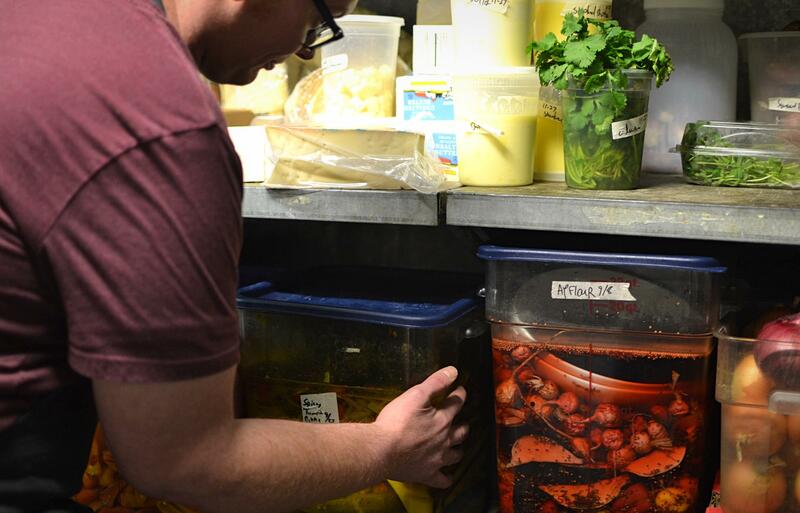 The head chef at Miel grabs food from a packed freezer. Other times, she’ll donate the rest — a task that seems simple but can be pretty challenging. She often stays after the restaurant closes to package food, only to wake hours later and deliver it herself to a shelter so it doesn’t spoil. She calls it a labor of love. "In our dream world, we would have someone coming by at the end of the night picking everything up. But we realize that’s not realistic at 11 in the night." Some larger kitchens at places like Music City Center have been able to hire staff to coordinate deliveries. And one of the largest shelters in Nashville, the Rescue Mission, is just down the road and can send drivers to the center's warehouse. The business has been able to give away more than 190,000 pounds of food. But that doesn't mean it's easy, said Music City Center CEO Charles Starks. "Would it be quicker and easier today to have discarded all that food into a dumpster, than it was to sort it out, separate it, have labor to move it out get the truck? Sure it would have been," Starks said. But the other part comes from significant financial and time investments. This enterprise, he said, requires lots of planning, resources for packaging, and a team of dedicated employees. "Why would we want to throw something away that could benefit someone else? I mean it just doesn’t make good sense," Starks said. But it’s not practical for restaurants like Miel to do this, Prasad said. There have been attempts at food pickup for restaurants in Nashville. But one of the main services, Nashville's Table, stopped and shifted its focus to grocery stores after it got absorbed by a large food bank in Middle Tennessee, Second Harvest. And there are some phone applications — like Meal Connect — that show when businesses have food to donate, but they still don’t help with transportation, said Linda Breggin of the Nashville Food Waste Initiative. "And that’s where I think there’s promise with these businesses delivering food. They have the networks," Breggin said. She explained the same companies that allow customers to order a driver who picks up food from anywhere are now making that service available to restaurants. They can pay to have their food donations taken out. In fact, Postmates piloted a program in Los Angeles. Drivers picked up and delivered 1,000 pounds of food in just two weeks. Now the company is expanding the project to Nashville and other cities, according to Disney Petit, a manager at Civics Lab, a sustainability team at Postmates. "When the restaurant has closed for the evening, they get a pop-up that says do you have leftover food that you’d like to donate? And they just press a button that says yes." Petit says its growing network of drivers could be the missing link to reduce restaurant food waste. But now Postmates is running into its own scheduling problem: identifying recipients that can take food after hours. "As soon as we can find a shelter that is available to accept this food at a reasonable time when restaurants are closing, we’ll be able to make a huge impact." Many food banks and shelters don’t have overnight staff to process and store perishable meals. One of Nashville’s largest homeless organizations, The Room in the Inn, often relies on volunteers during normal business hours, said community development director Melanie Barnett. A local boys hockey team helps staff the kitchen at Nashville shelter, the Room in the Inn. "We do have an overnight staff member, but that individual is also in charge of a hundred people that are staying with us, so they aren’t able to accept a donation late at night," Barnett said. The shelter never wants to turn away usable meals, but right now it can’t justify dedicating personnel for sporadic late-night food donations. "We can be creative, but we have to plan ahead because it’s hard to react," she said. Awareness about food waste is growing both locally in Middle Tennessee and on a national level. President Trump has even launched the “Winning on Reducing Food Waste” initiative to encourage more participation and fund education around it. But increasingly, advocates say there has to be a focus on the practical barriers, too. There’s a willingness to rescue food for a good cause; people just need a better way to find a home for their unused meals.